Denton and Reddish MP, Andrew Gwynne, will back a Labour binding vote in the House of Commons this evening (Wednesday 24 January) which will require Ministers to hand over their risk assessments of contracting giant Carillion and the plans the Government had to improve them to a Parliamentary select committee. The Opposition Day Debate led by Labour, and subsequent binding vote, relate to the same documents for all of the Government’s “Strategic Suppliers” whose performance could have huge impacts on the running of the public sector and costs to the public purse. 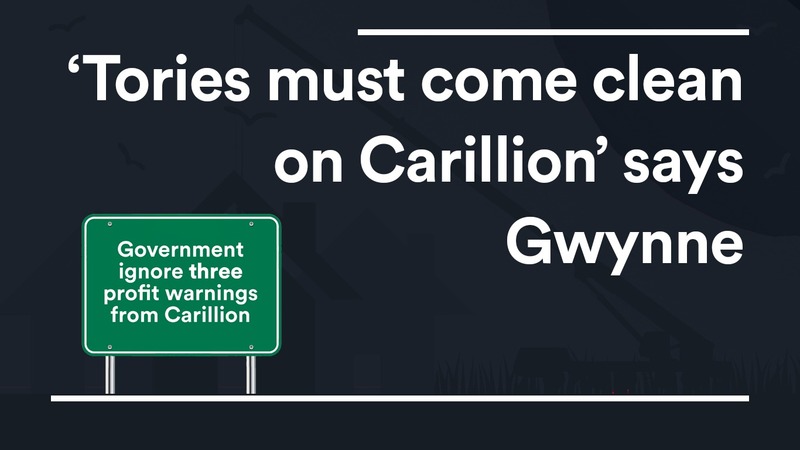 The debate comes amidst growing criticism about the Government’s refusal to publish any details about its contingency plans for Carillion’s collapse, which has endangered 20,000 jobs, thousands of people’s pensions and thousands of small businesses further down the supply chain. Labour’s debate will call on the Government to reveal the extent to which the running of public sector is threatened by the Tories’ insistence on extensive outsourcing. Labour’s motion will use an ancient, but still effective, Parliamentary procedure as it did to force the Government to produce the Brexit Impact Assesments. This gives the House of Commons the power to require Ministers to release Government papers to Parliament. If passed, this motion will be binding on the Government. Labour is demanding the papers be released to the House of Commons’ Public Accounts Committee which would then have the right to review the materials and determine what information is put in the public domain. If the Government opposes the motion they will confirm that the Public Accounts Committee should not carry out its function of scrutinising Government’s spending and procurement. “Carillion’s collapse has exposed the Tories’ reckless over-reliance on outsourcing in our schools, hospitals and other public services.